Take the Sentence Master Challenge it's FUN, it's EASY, and it's FREE !!! This Sentence Master English Writing Practice Challenge # 3a has 6 word cards. 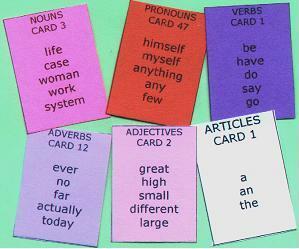 Players can use only one word from each of the 6 cards to total 6 words. Scoring is one point for each word used in a complete sentence and a penalty of one point for each word not used or used incorrectly. Players must provide their gender, age, city, nation, region, first language and their status as a student or teacher in their email. Your emails and addresses will not be disclosed, sold or given to any third parties. We will post the best entries - Good luck with your entry!! Sentence Master English Writing Challenges are free to practice sentence creation, sentence construction skills, using the parts of speech, phrases and clauses.